Mrs. HH and I grew up on a farm and take certain things for granted. But our college and career experiences have given us a chance to meet a broad range of people with many different perspectives. Here are a few questions we have been asked about ranching/farming. 1. What does “Angus” mean? Mrs. HH was asked this question while dining at a restaurant that had ‘Angus Ribeye’ on the menu. “It’s a breed of cattle,” she explained, “like pit bull is a breed of dog.” “You mean it’s not a brand name?” Umm, no. 2. Why don’t your bulls have horns? This question came from one of my colleagues who volunteered to come help us work calves. (I bet that won’t happen again.) He was under the impression all bulls have horns just like in the movies. I explained to him that this isn’t the movies and a majority of cattle producers have polled cattle. What does polled mean? No horns! 3. If the bulls don’t have horns, how do you tell them from cows? 4. I thought all cows were black and white? Friend: “Milk cows? But I thought since they are on the Eat More Chicken commercials then that is what kind of cattle are in the grocery store. 6. What is a steer? I’ve been asked this question so much I don’t know who first asked. I usually answer in a variety of ways. They have misplaced their manhood. They are the ones that have lost their marbles. They're the ones who back-talked their wife? 7. Where do the cows go in the winter? In the winter time cattle depend on us to provide them protein and hay when they get short on grass or if there is bad weather. I thought that was clear enough, but a barrage of follow-up questions proved me wrong. “They stay outside? What is hay? What kind of protein? Like the protein bars?” This took me a while to sort out. I nearly had a question overload. 8. Do they always moo this much? This question was asked when we had separated the cows from their calves for working. The answer is yes, cows can be quite the annoyance this time of year. 9. What are calf fries (or Rocky Mountain Oysters)? 10. With all of this work, why doesn’t beef cost more? Remember the colleague who came to work calves? The day went something like this. 5:30 am: Get up to cook breakfast. 8:00 am: Work calves and worm cattle until complete, or until we collapse from heat exhaustion. Which ever comes first. I know, right? Like, we're supposed to bring the cows inside for winter? Please. You forgot to touch on cow tipping. I remember the Oklahoma city tv reporter who did a story about the fund raising "Mountain Oyster Fry" for a small town FFA chapter. She ended it with the comment that it provided a great social event and allowed everyone to have a seafood meal. I was in a country themed restaurant once. There were lots of antiques and cow pictures and such. The bathroom doors were labeled "Heifer" and "Steer". Yeah. Think about that. Where do the rest of us go? @Clayvessel, that sounds like very bad categorizing! My husband would have refused to go in a door called Steers, just on principle, I'm sure. Thanks for the comment! I am going to speak to the Hollywood thing. 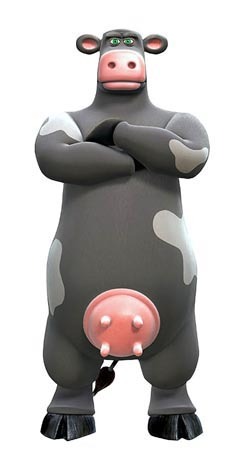 Have you ever seen the movie Barnyard? This little gem of a childrens' movie sports male cattle with utters. When we watched this movie Mr. HH's niece and nephew (my kids) looked at me with big eyes and said "Mom, boy cows don't look like that." I can see how limited perspective and television could be a bit confusing. Is it also a cartoon on cartoon network? That cartoon makes me crazy - this boy-sounding cow who calls himself a 'he' is walking around (and they walk on their back legs) with distinctly non-boy parts sticking out and flopping everywhere. It's ssssssooooooo wrong! Here, I found a link!